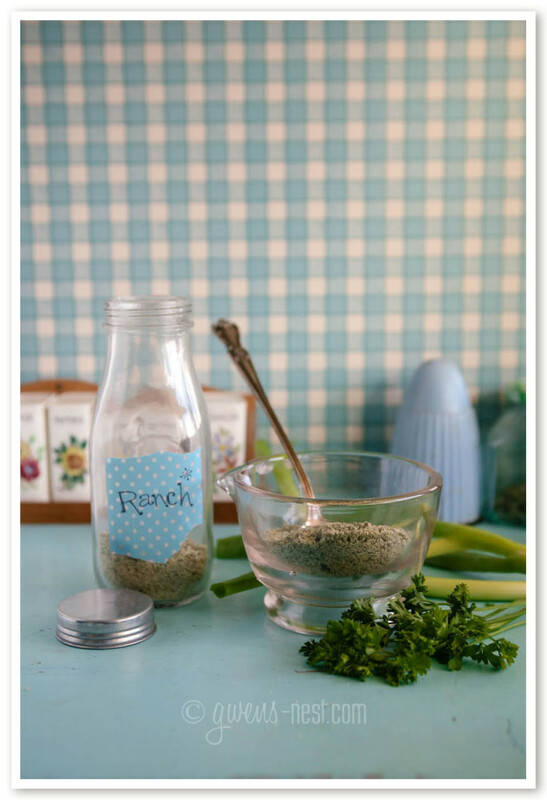 A good ranch dressing recipe is something every home cook should have in her recipe box. This is the one I have in my box. And it is GOOD! I’ve been working on this recipe for a couple of years, as I really want to avoid MSG and fillers…and fresh is just SO much tastier! Well, theoretically. It should be tastier, you know? But I had a lot of trouble finding a really good ranch dressing recipe. They seemed to kind of fall flat or hit spicy or odd notes that didn’t even come close to the twangy goodness that we all know and love. But I’ve finally landed on a blend that is just totally delicious. It has received a unanimous thumbs up by the National Association of Picky Children. (I happen to know several of the NAPC board members personally.) And on top of that, I’ve recently been informed that a jar of this spice mix is the birthday present of choice by some of my favorite cooks. Oh, and also, this is TOTALLY Trim & Healthy approved…I’ll even give you a recipe for my fat-free Ranch Dressing for Fuel Pull or E style salads in the printable below. All that’s in my mix are herbs and spices. I’d much rather stock up on some good herbs, and toss this spice mix together than buy the (now way more than) $1 each packets of commercial spice blends. Because I make it in bulk, it doesn’t take long, and I get at least 3-6 months worth of spice mixes out of this big batch. Pretty much, all you do is just measure the herbs and spices all into a jar and shake! It took me about an hour to make 2-3 cups of each spice blend, but your time may vary…I had a toddler hanging from each leg. Totally worth that time to get a stocked pantry full of delicious ‘convenience’ spice and seasoning mixes! Bulk batch in a pint jar…I write the how to use directions on the lid. I have found that running it through the blender to powder it allows the flavors will blend in quickly in dip mixes and recipes. It’s easy to do with this spice grinder blender trick! With the higher amount of onion in this recipe, I do find that powdered onion tends to absorb moisture and clump , but I just reblend it or use a fork to loosen it up. Update: I have found that granulated onion is a MUCH nicer choice for preventing clumping. One of my other favorite ways to use the Ranch dressing recipe (besides making dressing and dip) is as a seasoning blend. I store about half of the batch in a shaker bottle, and sprinkled on baked potatoes, french fries, roasted veggies, and all over our favorite baked potato pizza recipe. It’s become our house blend that I reach for when I want a fresh, oniony, zesty flavor. I want to hear if you try it…let me know what you think by rating the recipe below! 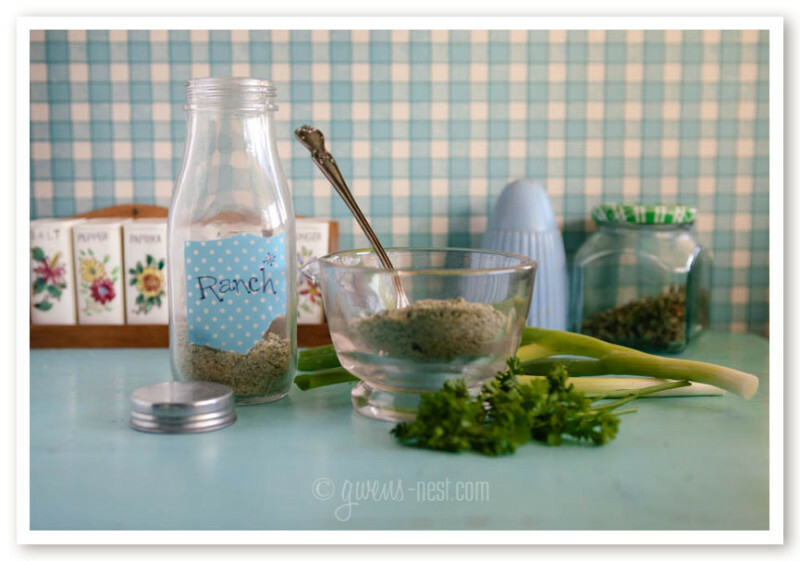 Ranch Dressing Mix that comes straight from herbs and spices is SO much tastier than the MSG laden packets. This creamy, zesty blend makes amazing dip, dressing, and has become our house seasoning of choice on fries, popcorn, and more. 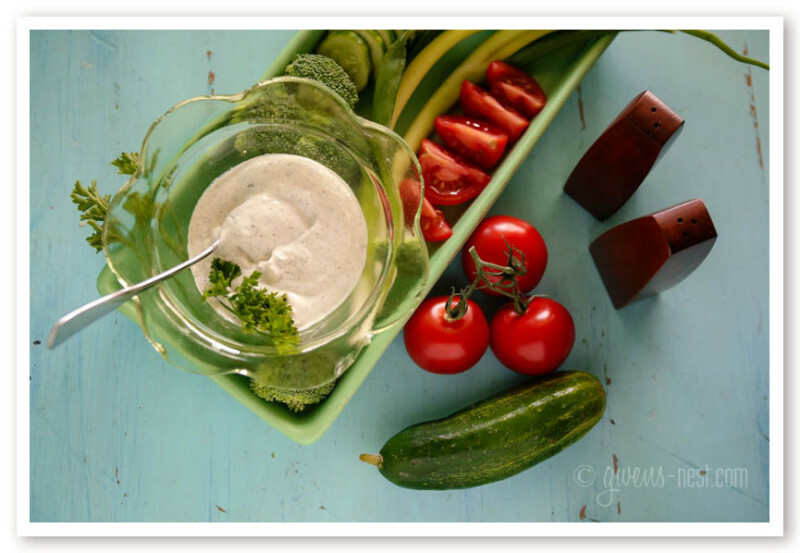 The directions include FP or S versions of this yummy Ranch Dressing Mix for all of you Trim Healthy Mamas. Yields about ¼ cup of mix; enough for 2-4 cups of dressing or dip. Yields about 2½ cups of unblended mix...but it's a little less bulky if you blend it. I keep some of mine in a shaker jar and the rest in a pint jar. Shake spices together in a jar. If you’d like to create a "fast blend", then powder your mix by screwing your blender base onto any standard mouth canning jar, and blend your herbs until powdered. This will make the flavors blend in a lot faster when you use it in recipes. Using full fat mayo or sour cream will really dull the flavor of the spices, so you'll want to use the larger amount of mix in that case. If you use light sour cream or mayo, then use the lesser amount called for. All the measurements can and should be adjusted to your taste. If you don't powder your spice mix, then use the larger amount. If you do powder it, then use the smaller amount and adjust to taste. Blend spices and sour cream, and add enough buttermilk to thin to pouring consistency. You may sub ½ cup of mayo for ½ cup of sour cream if you prefer. Salt to taste. 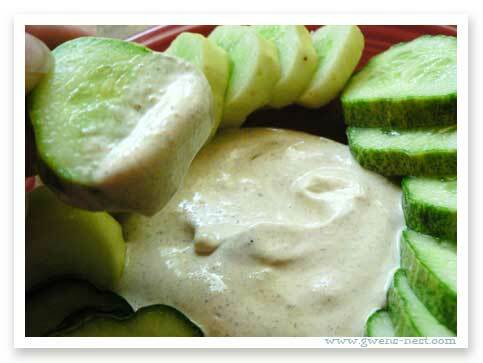 Fat Free (FP) Ranch Dressing or DipUse only 1 t.of Ranch blend seasonings and sub 0% Greek Yogurt for sour cream. Use unsweetened almond milk instead of buttermilk. Thin to pouring consistency for dressing, and adjust flavors to your liking. To create Fuel Pull for any recipes here, simply follow these substitutions, and start with very small amounts of the seasonings/spicy ingredients, as there is no fat to blunt their intensity. Blend and serve. You may sub ½ cup of mayo for ½ cup of sour cream if you prefer. Blend all ingredients and serve. You may sub ½ cup of mayo for ½ cup of sour cream if you prefer. Here's an easy way to cut out yet another MSG product with the flavored rice mixes! Add ingredients and water, according to your rice cooker directions or favorite recipe/method for steamed rice. For the buttermilk….I normally mix my regular 1% milk with lemon juice or vinegar to make buttermilk. Will that work for this recipe and keep it in THM guidelines? In your layered photo, there’s a band of dark red that does not seem to be represented in the ingredient list of this recipe. Paprika perhaps? I’m getting ready to mix up some of this dressing mix, and don’t want to forget any ingredients … Thanks! This sounds lovely! Can’t wait to try it out. I’ve been on a quest lately to find homemade mixes. If you mix it up yourself, you know what’s in it. And I have 2 bona fide members of NAPC and a grown up one! Luckily, they love ranch! I made this and blended in my Magic Bullet. Let it sit overnight to marry and when I tasted it the next day, the garlic BLEW MY SOCKS OFF! Is this a strong garlic recipe, or you suppose I used the wrong amount??? I want to use what I have but it burns my mouth! I thought about adding another 1/2 cup of sour cream and 1/2 cup mayo then another dose of each spice EXCEPT garlic to see if it blends out…..
Hmmm…the only two things I can think of are that maybe your garlic powder is super potent, or you can just use less in your recipe. Are you using full fat sour cream in your final mix? If not, cut back the amount you’re using, because the fats really mute and mellow the flavors a lot. Tried this recipe, my kids love it!! (as do I) and now I just always have some in the fridg- veggies are being eaten regularly in my house now!! Thank you!! I love this!!! Thank you!! Do you have a recipe book? Thank you. Just tried the chocolate shake and loved it. Hi Karen! SO glad you enjoyed it. 🙂 I don’t have a cookbook out yet, but it’s something that I’m working toward. I’m hoping next year? Thank you for asking!!! Can you make the mix with less salt and still have it work? 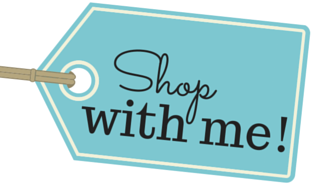 Due to blood pressure I have to limit the salt so I’m looking for replacements of all packaged items to cut as much as I can. Is 1/4 c salt correct? I used the mixture for onion dip and the salt is over powering. That’s the measurement I use with my sea salt, but it’s damp and a course grind. I amended the recipe to suggest half that if you’re using a fine grind of salt. Thank you for pointing that out, and I’m really sorry if your mix is too salty…maybe you can adjust the other spices to compensate? I am a newbie on THM but I found that you summary guide is very helpful. I was looking at your recipe for the Ranch dressings etc. and wondered where you found your glass container with tin lids?